AR-2t is not a mistake, but it is an idea to improve the mid-high frequency of my AR2s. At the moment I have connected in parallel a couple of AR-1MS to the older sisters AR2 (I have also turned the speaker upside down to have the 10 "woofer closer to the middle / high part given by the AR-1MS pair). I disconnected the bridge connection that fed the original pair to eliminate the original tweeters. How the AR2s sound with the additional "tweeter": noticeably improved the high frequency, the mid-range is very present, in comparison, for the same volume delivered, the AR2 AR-1MS complex, has mid and more sound pressure compared to AR2a (I suspect that the perceived sound seems to be about 3 db higher than the three-way sisters). Very, very satisfying and a lot of improvement in distinguishing the musical instruments of the played songs. I would like to have an advice to be able to insert a correct crossover filter (maybe just a coil?) To make the AR-1MS work as a medium / high unit (not as a fullrange speaker), removing the overlay of low frequencies, leaving the only AR2 woofer to deal with bass. I understand little about electronics, I have no ability to design a correct crossover, I hope to receive valuable advice and help from authoritative and competent CLS members. I like this. 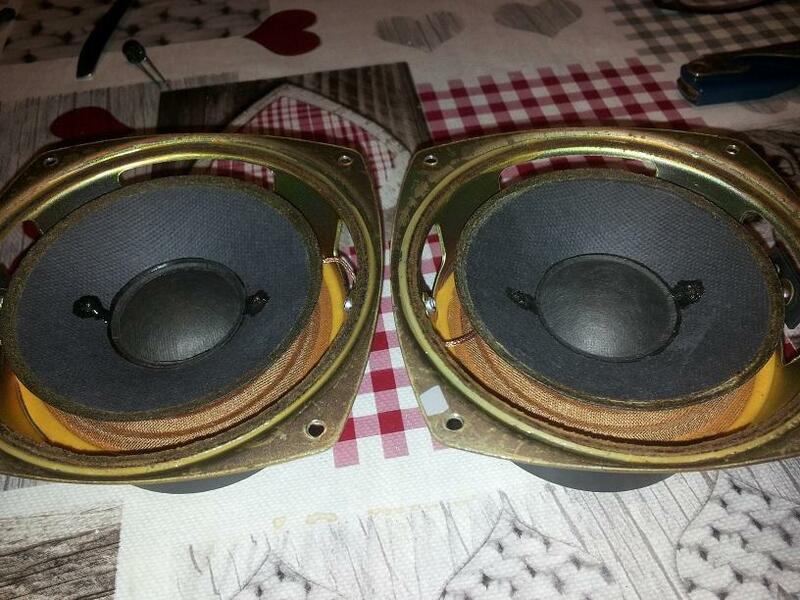 Is the AR1ms the mid and tweeter for a 58b and 48b? 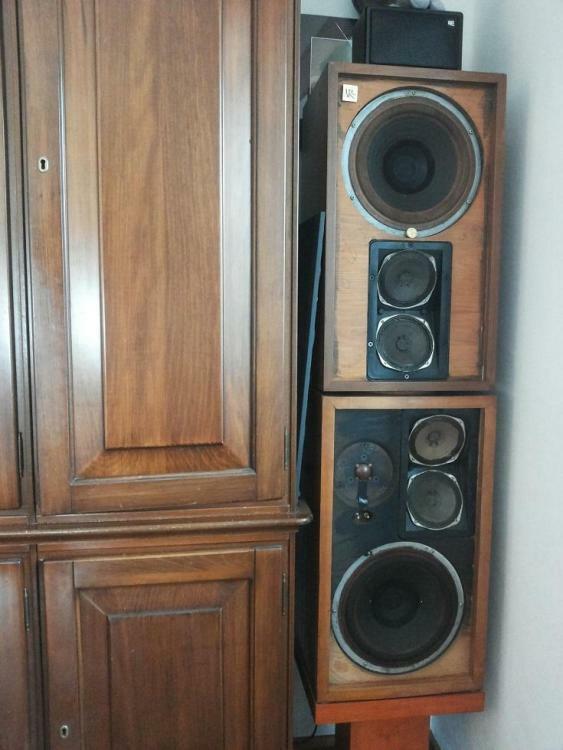 If the 1ms is doing a good job with mids and highs, you'd be better off removing the jumpers to disconnect the original mids/tweeters and just use the 2s as woofers. Positioning the speakers vertically is producing a narrow vertical mid-frequency beam along the front axis of the speaker boxes because the cross-fired drivers were designed to be placed horizontally. 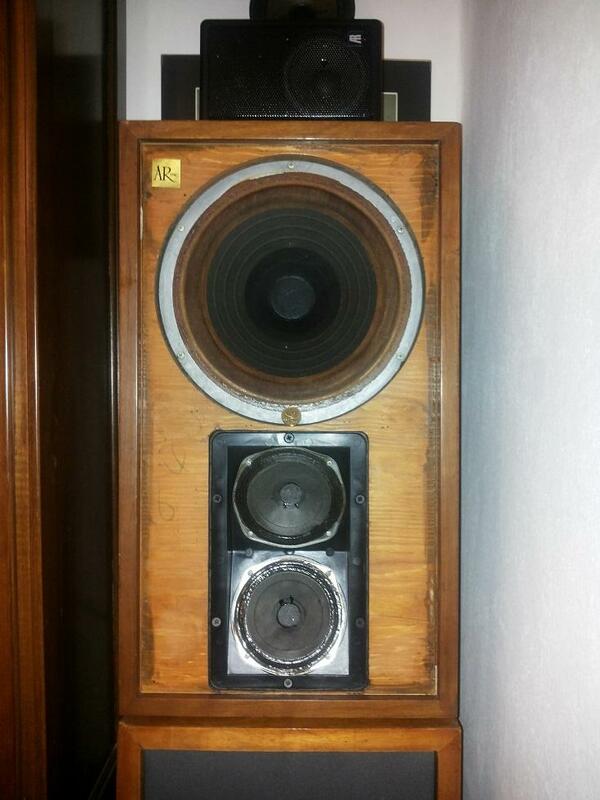 The 1ms is a 8 ohm speaker with a bottom end somewhere around 85-90 Hz. Response becomes a bit ragged below 200 Hz. 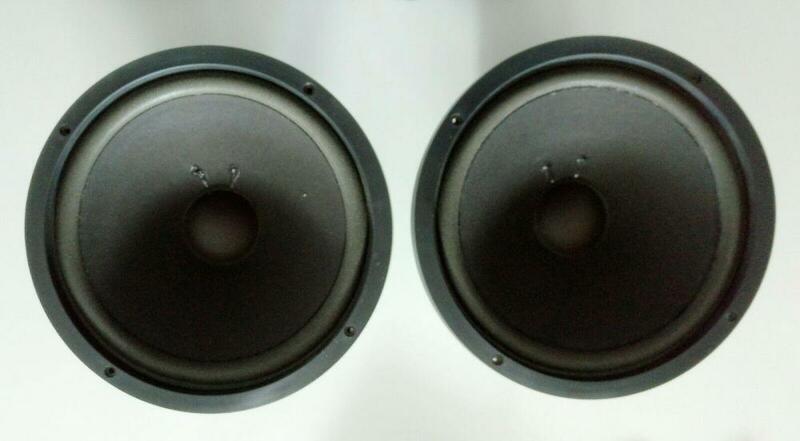 The 2 and 2a are 8 ohm speakers whose woofers cross to their upper drivers at 2000Hz. If you insert a 100mfd capacitor on the + lead to the 1ms, that will provide a high-pass filter that cuts off frequencies below 200Hz. If you're happy with the performance of the 10" woofer in the 2s, then just removing the jumper will roll them off at the original 2000Hz and no additional coil should be needed. Thanks, especially for the advice on the capacitor. 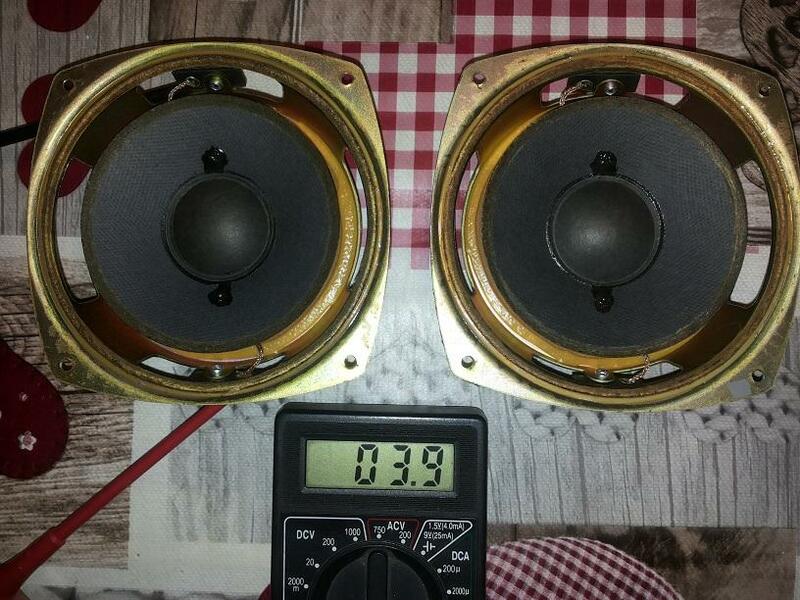 The 10" woofer in the 2 is a more capable driver than the 4" woofer in the 1ms. If reducing driver stress is your goal, you'd be better off raising the high-pass filter frequency to take the load in the under-2000Hz range off the 1ms. I am glad to see interests in modifying and adapting available parts and drivers to improve the sound of speakers already in your possession. Here is an article that tries to combine the good performance in mid and high of a small speaker with a dedicated woofer. While the impedance of the speakers in this article is different from yours but the methodology could be valuable for your project. 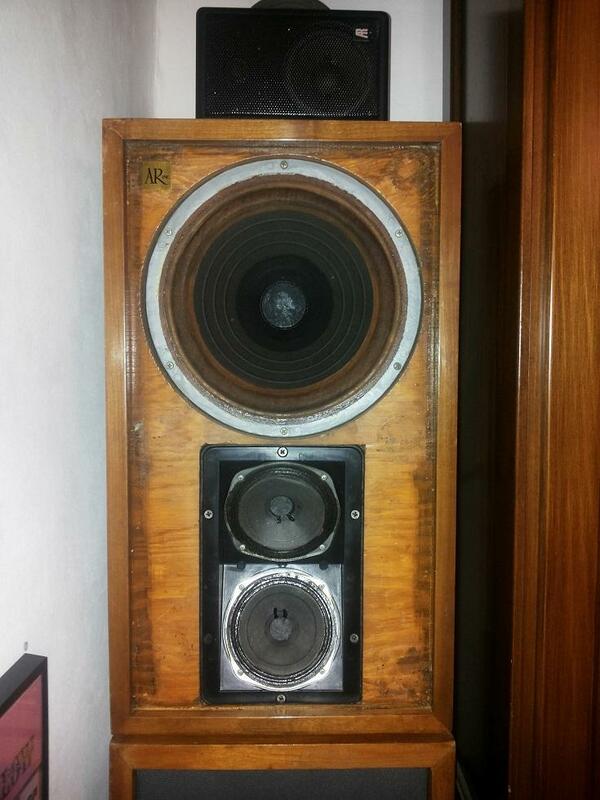 In the 48B and58B the woofer crossed over @ 400hz. The AR5 crosses at just over 600hz and has a jumper like your 2. You are updating the 2 to the performance of a a 48B if you crossover in that range. Here are the response curves for the 2 and the 1ms (1ms on top). The 2 has a flat response up to about 1200Hz, after which response becomes more variable for the upper 800Hz of its operating range. The 1ms is relatively flat from about 700Hz up, and is rather jagged below that. I'd say your best crossover point would be somewhere in the 800-1200Hz range. 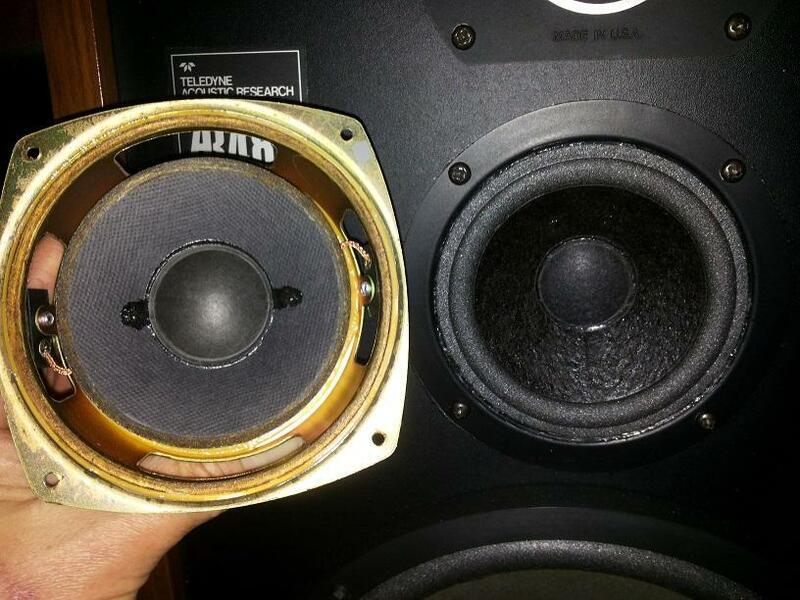 The 4" woofer in the 1ms and the 4" mid in the 48 series are not the same P/N. The tweeters in the two models also have different P/Ns. Thank you for your cooperation and help, thanks Genek for the two graphs and the suggestion of the frequency cut around 700 hz. I wanted to avoid: first the useless low-frequency stress of the small 4 "woofer and no less important the strengthening of the common frequency of the two speakers. Currently, comparing the AR2a and AR2 + 1MS pairs, the latter certainly sound more efficient, surely the yield in the mid range has increased, the yield in the high range has been greatly improved (excellent, but perhaps less intrusive, the AR2a tweeters yield - between the 'in my opinion these tweeters are slightly more "bright" than the .75 "brothers). 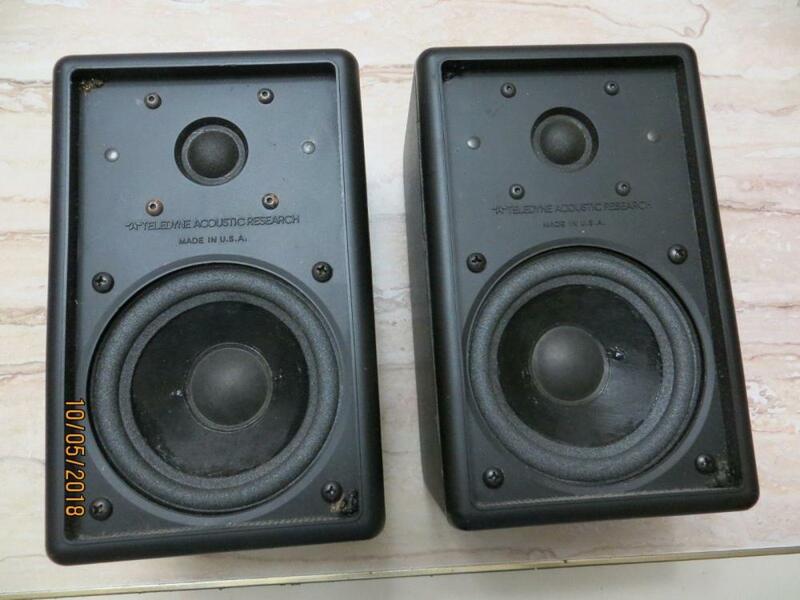 As I think you have already seen, I have numerous AR speakers, mainly from the '60 till'70, the only exceptions to the most recent production are the AR-1MS, the AR48s and the AR10PII replicas (I also think these reflect the original AR philosophy, adequate at the times, more present and marked on the high frequencies, but with the original AR matrix on the supply and presence of low frequencies and the unique characteristic of being able to be listened to for hours and hours without fatigue or stress to the ear! I had already written in another post that practically the AR2a (placed in the kitchen / dining room) are in operation practically from morning to night every day and they are the speakers to which I am more attached, the same is happening with the AR2, in comparison both play discreetly (it means never annoying at any volume), currently the AR2 + 1Ms seem more efficient by a few db compared to the three-way sisters, the ranges of both are full and defined. Genek, looking at the curves of the graphs you posted, the two speakers (AR2 + 1MS) with adequate filtering would give a more neutral speaker and with a much more extended frequency, this is what I would like to achieve, I am in no hurry and the best works are performed with thoughtfulness and taking all the necessary time. 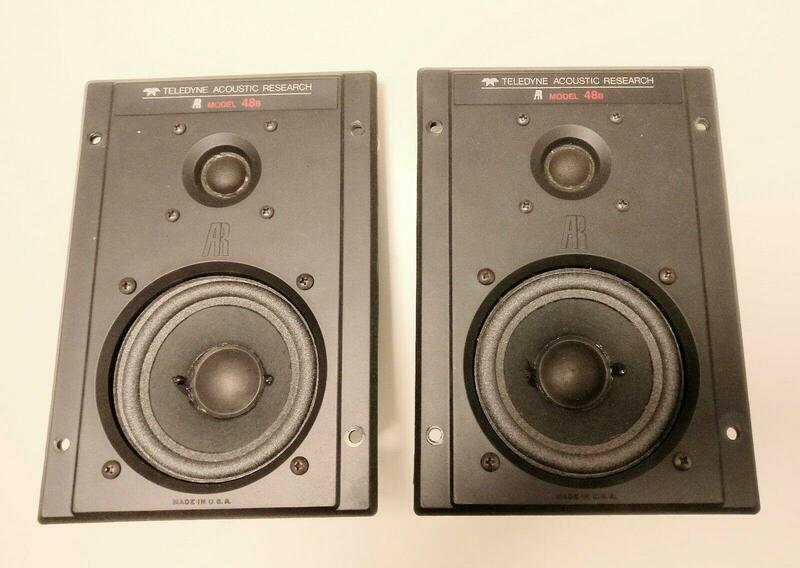 If all you want to do is blend this pair of speakers you can remove the 2 series jumper, choose a capacitor for the 1ms and use a graphic equalizer to reduce the output in around the 1kz range and get very close to what you want. IMO. Consider doing what Micro Acoustics did when they designed their add-on tweeter. Multiple capacitors and a switch to enable the selection of different crossover frequencies. The MS1 could be set to cross at 2500 or 5000 Hz. 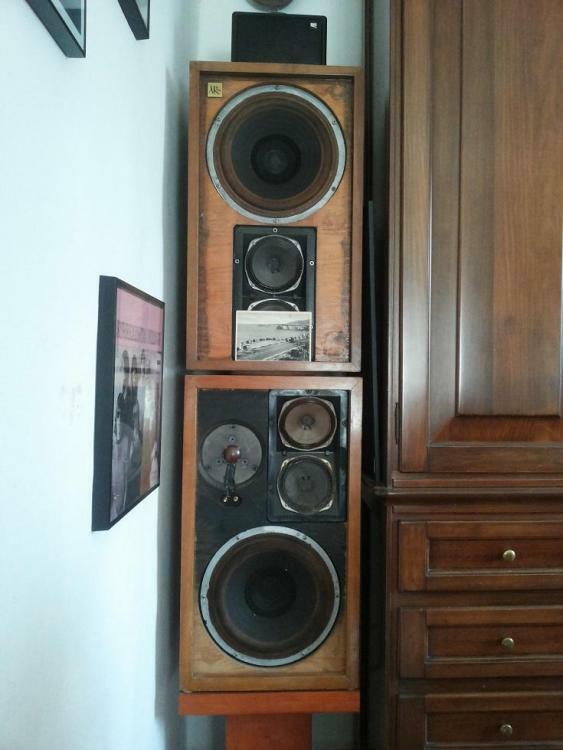 For this setup, I would suggest switching between 700 and 1400 Hz (which was the crossover frequency of the early 2ax with cloth surround woofer). 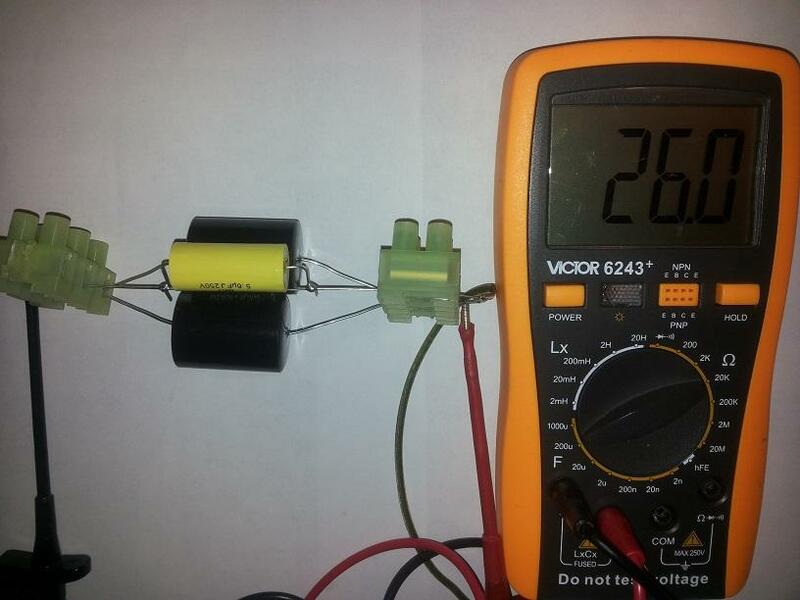 I found an Italian site where you can determine: crossover frequency cutting and capacirors, coils and resistors to build the dedicated crossover. 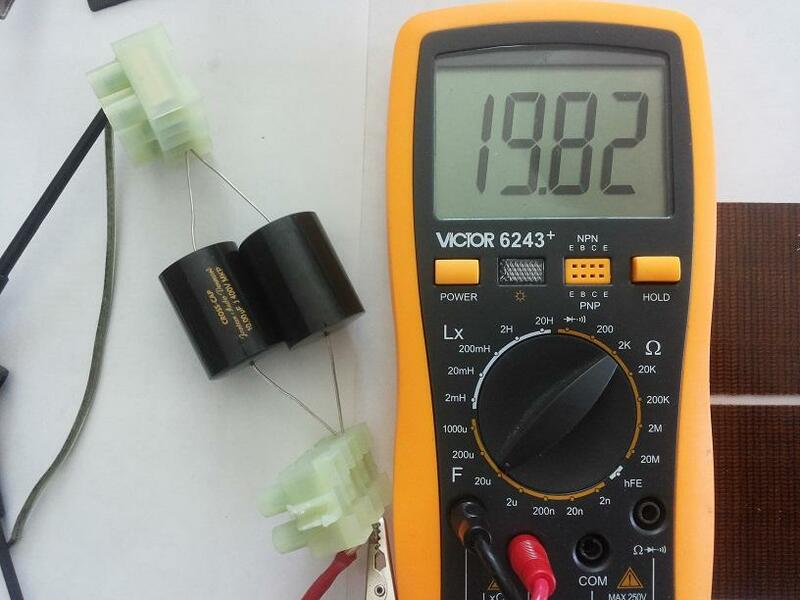 I started with the sum of 26 microfarad capacitors, the small AR-1MS comes the whole low range, I lowered to 19.82 mF, better but the small woofer still receive low frequencies, I will try to lower the capacitor values again (sequence of around 16 - 10 up to try 6mF like the original cut). I also think of adding a resistor to reduce the efficiency of the small speakers compared to the AR2 woofer, updated after the tests. A level control would probably be a good idea. How are you determining frequencies? Are you measuring, or just doing it by ear? Hi, as you know, I understand very little about electronics but I have good manual skills and a lot of inventiveness. Discrimination by ear, comparing the left and right speakers and further comparison with the AR2a pair placed under the AR2s. Regarding the attenuation of the mini speakers I will try with a pair of 3 ohm and 10w resistors (removed from a pair of late midranges of AR2ax). 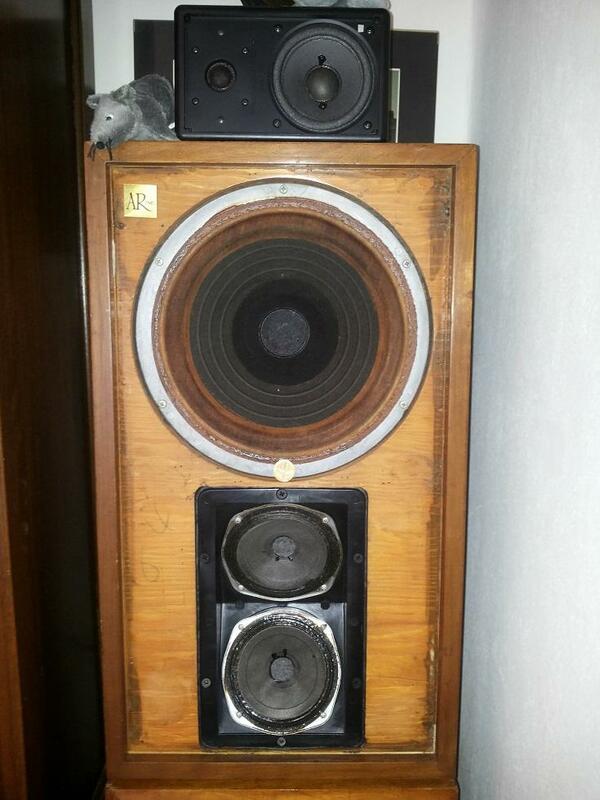 Today I purchased an additional pair of mid / high section AR48b and a pair of woofers from the same speakers. I am almost certain that the mid / high content has dimensions very similar to the one containing the mid / high pair of AR2s. The first photo shows a pair of AR-1MS ( not mine ), the following my purchases. 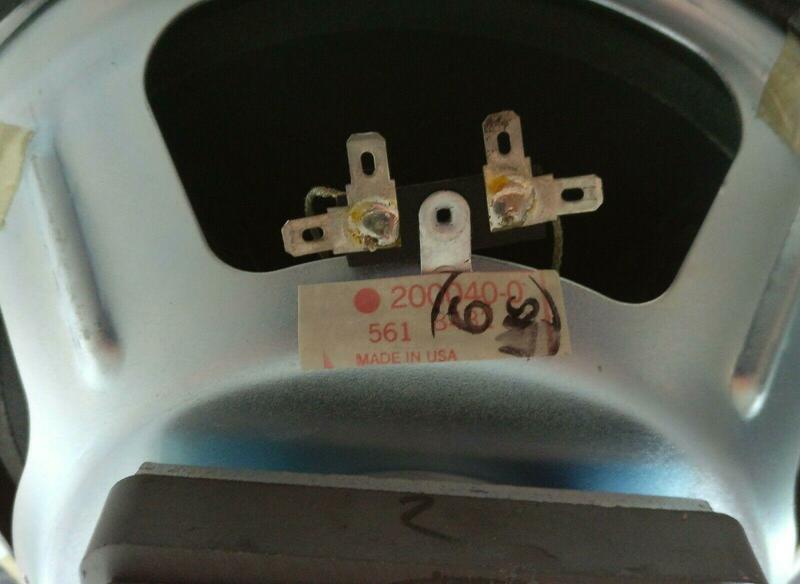 Can you read the P/N for drivers used in AR 48b mid/high and AR 1MS. They do look alike. AR 4" mirange/woofer is a very capable driver. 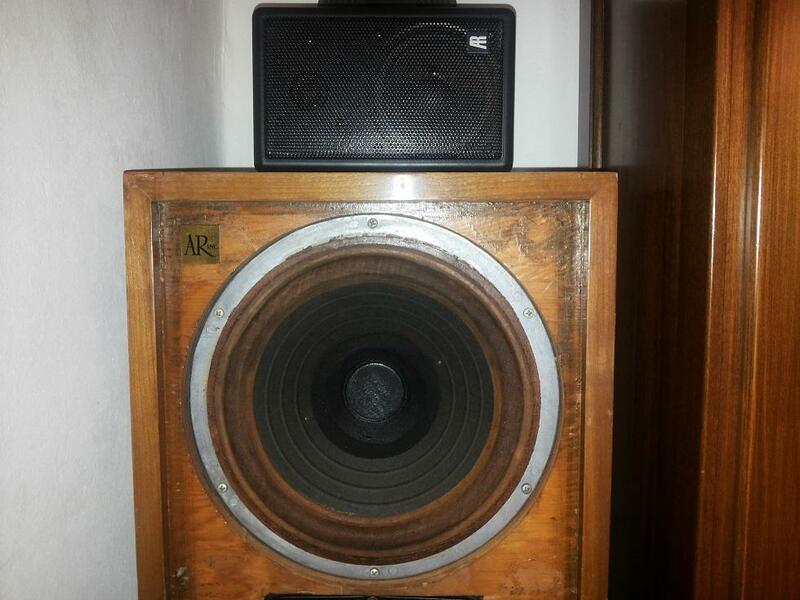 I had good experience with poly version of AR 4" woofer. 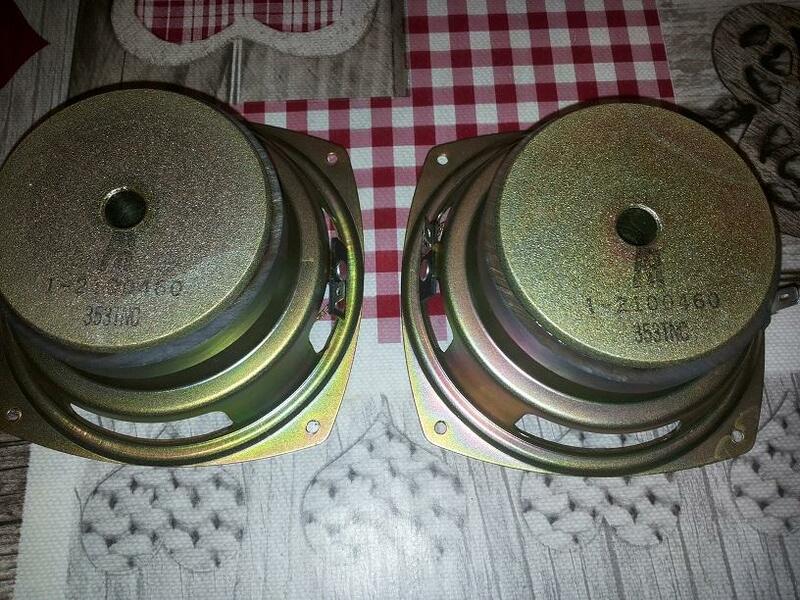 Hi Ligs, I looked in my photo archive and I found the photos of when I refoamed the 4 "woofers (unfortunately I didn't photograph the back of the tweeters - they are still TNG made, with nickel gold of the magnet) and you can see from the photos the type number and the magnet which is round (basket and magnet both nickel plated gold), TNG manufacturer, both woofers measured at 3,9 ohm. "Over the years I have seen other AR-1MS, older and there are differences in the cone paper, I am also attaching the mid photo of my AR48s (square magnet, different basket) and cone made with a particular paper, with a treatment and cone cut (visibile nella foto ad h.6), welded and joined, in my opinion the most well-sounding cone mid ever heard"
I seem to recall , a reviewer said something about AR used felt instead of regular paper cone for the 4" midrange. The same reviewer also said about the crossover was also quite unique. 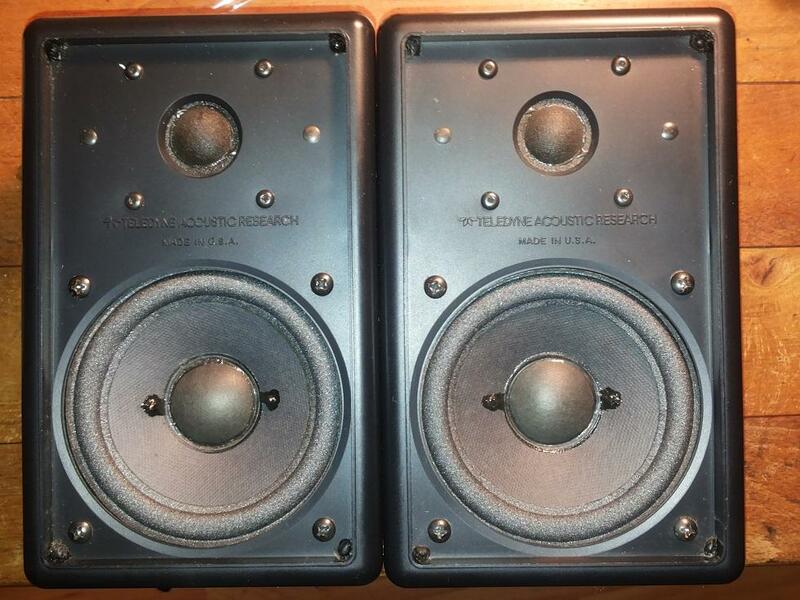 I had a few pairs of AR 1MS before, one pair had the the same kind of seamless cones as in your picture. But one pair had a straight seam through the cone from the dust cover to the foam edge. Hi Ligs, in my opinion the small 4 "cones (both woofer and midrange versions) are magical. 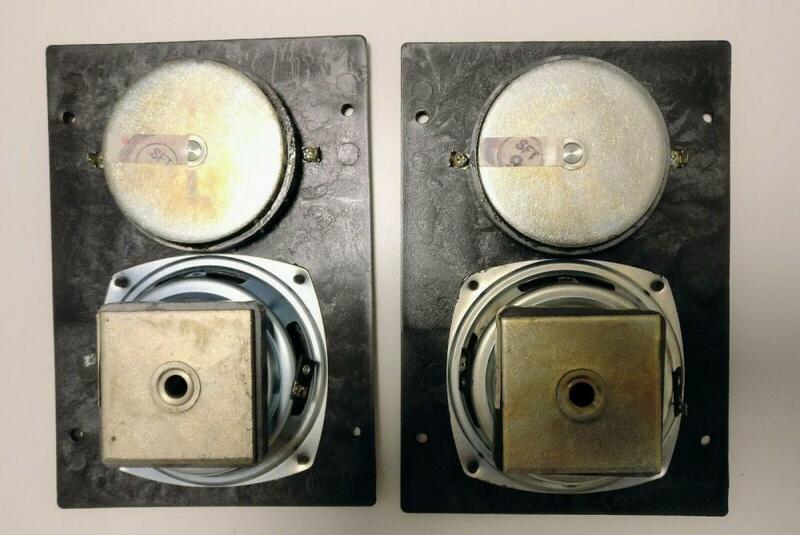 We will see the differences between the 4 "TNG (round magnet) and the 4" woofers made in the USA (square magnet). The blue trace was from a pair of AR 4" poly and a Dynaudio D28 in MTM configuration. The yellow trace was from Infinity Primus 162 and red was from KEF Reference 102. Since they were measured at different times and so the conditions were not identical. Each division of the vertical scale is 5 db. The X-axis is the frequency. But the general smoothness and flatness made this little AR MTM sound very pleasing especially for vocals, IMO. I remember I bought 4 of AR 4" poly midwoofers(#210095, TNG) from an AR service center in Pennsylvania in 1988. 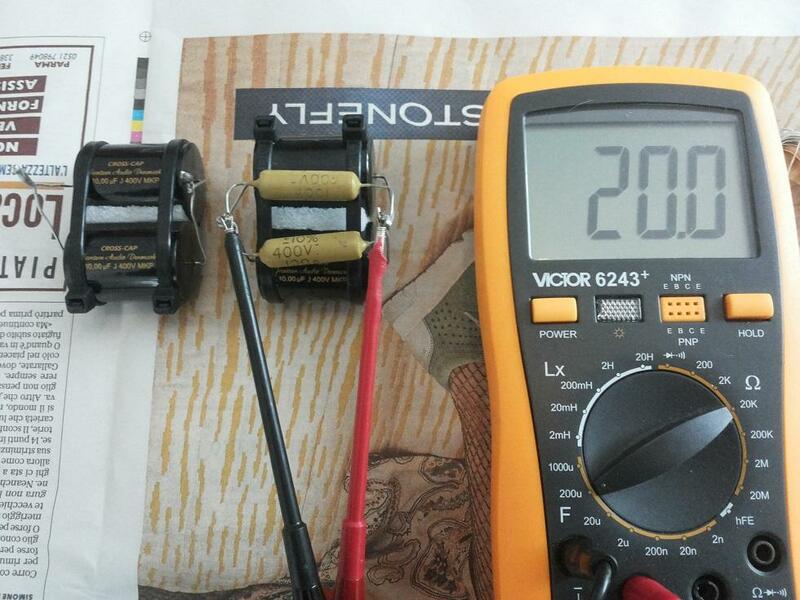 I decided to stay with the 20.00 mF capacitors, welded Jantzen 2 x 10 mF (in one added 0.2 mF) and finish this project. 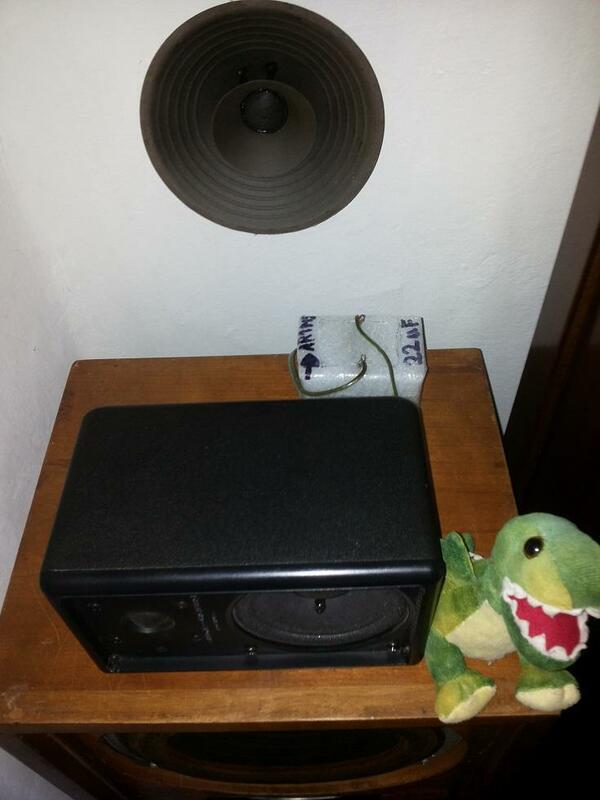 In the photos you can see the capacitors, the measured values, the foam containers, the speakers in order of listening.